The study, the first to look at the cerebellum's granule cells in living animals while they learn a task, reveals that the cells not only relay sensory data but also produce signals that encode ongoing behaviors. It’s the part of the brain that makes sure you cannot tickle yourself. The cerebellum, an apple-sized region near the base of the skull, senses that your own fingers are the ones trying to tickle, and it cancels your usual response. Now an international team of researchers, including Andrea Giovannucci and Eftychios Pnevmatikakis of the Flatiron Institute’s Center for Computational Biology, has learned something surprising about this region, which despite its small size contains roughly half of all the neurons in the brain. These neurons, which were thought to fire only rarely as they take in information from the senses, are in fact far more active than previously suspected. The finding, published March 20 in the journal Nature Neuroscience, may signal a major shift in our understanding of how the cerebellum encodes information. The study is the first to look at the activity of these neurons, known as granule cells, in the brains of living animals while they are learning a task, said Javier Medina, associate professor and the Vivian L. Smith Endowed Chair in Neuroscience at Baylor College of Medicine, and a senior co-author with Wang. “We knew very little about how these neurons in the cerebellum were firing when the brain is engaged in behavior,” he said. The cells are packed into a dense knot deep in the brain, making them difficult to study. Through advances in brain imaging techniques and computer algorithms that detangle the signals, the team was able to explore in detail the firing patterns of these neurons while mice were learning a behavior. The researchers expected to see only a few granule cells fire at any given time, consistent with ideas that date back to the 1960s. The commonly held theory stated that the sparse firing patterns created a sort of neural code whereby each firing pattern represented a different sensory input or stimulus. The theory helped explain why there are so many granule cells: Distinct firing patterns involving just a few of the millions of granule cells would enable the brain to assign a different firing pattern to each stimulus — for example, a different firing pattern for the touch of the fingers versus the touch of a feather duster. According to the prevailing theory, these firing patterns then convey that information to other parts of the cerebellum, which process the information and send it either to other parts of the brain for more processing or to the motor neurons that tell the body how to act — for example, to ignore one’s own fingers or to swat at a friend’s tickling fingers. Instead, the researchers found that not only were many neurons firing at once to encode sensory information, but those patterns also encoded not just external information but also signals from other parts of the brain. In mice that were learning to associate a flash of light with puff of air directed at the eye, the granule cells’ firing patterns encoded information about the incoming light as well as the prediction that the air puff was imminent. Not only did the granule cells take in purely sensory information — a light is flashing — but they also received signals from other parts of the brain that something was about to happen that required a blink. The techniques developed by Wang and colleagues allow researchers to eavesdrop on this conversation. Using fluorescent dyes that flash when neurons fire, coupled with an extremely powerful imaging method called two-photon microscopy, researchers can view neuronal activity deep within the brain. Because the cells are so densely packed, however, seeing which signals come from which neurons posed a challenge. 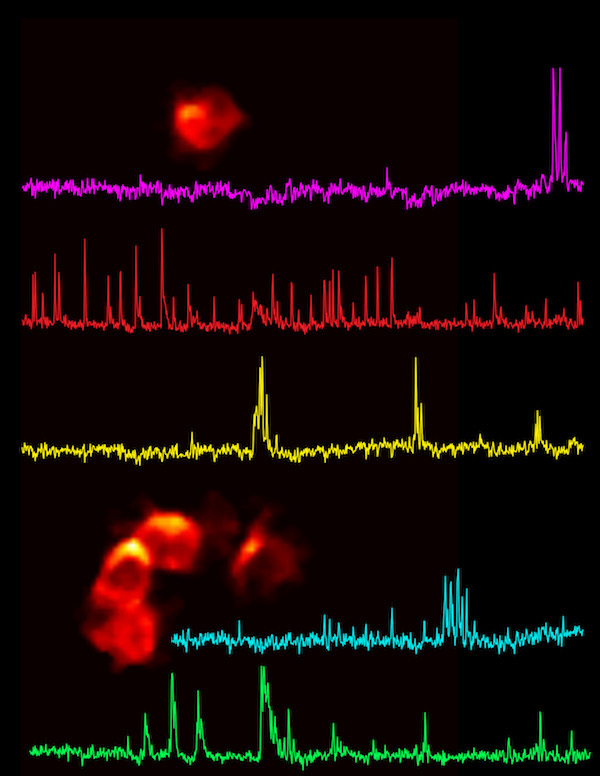 “This is one of the first studies in which one can image this type of neurons in the intact brain, and it was difficult to separate these signals,” said CCB’s Andrea Giovannucci, who designed and performed experiments, established the method for imaging granule cells, and analyzed the firing patterns while a Princeton postdoctoral researcher. The work built on a computer algorithm capable of separating out the signals that was developed by a team including CCB’s Eftychios Pnevmatikakis, formerly a postdoctoral research scientist working with Liam Paninski at Columbia University. In addition to the institutions named above, the study included researchers from Robert Wood Johnson Medical School, the University of Pennsylvania, Erasmus University Medical Center and Brown University. The study, “Cerebellar granule cells acquire a widespread predictive feedback signal during motor learning,” by Andrea Giovannucci, Aleksandra Badura, Ben Deverett, Farzaneh Najafi, Talmo Pereira, Zhenyu Gao, Ilker Ozden, Alexander Kloth, Eftychios Pnevmatikakis, Liam Paninski, Chris De Zeeuw, Javier Medina and Samuel S-H Wang, was published in the journal Nature Neuroscience on March 20, 2017. doi:10.1038/nn.4531. Click here to see the paper at Nature Neuroscience. This story was adapted from an announcement by Princeton University and used with permission.